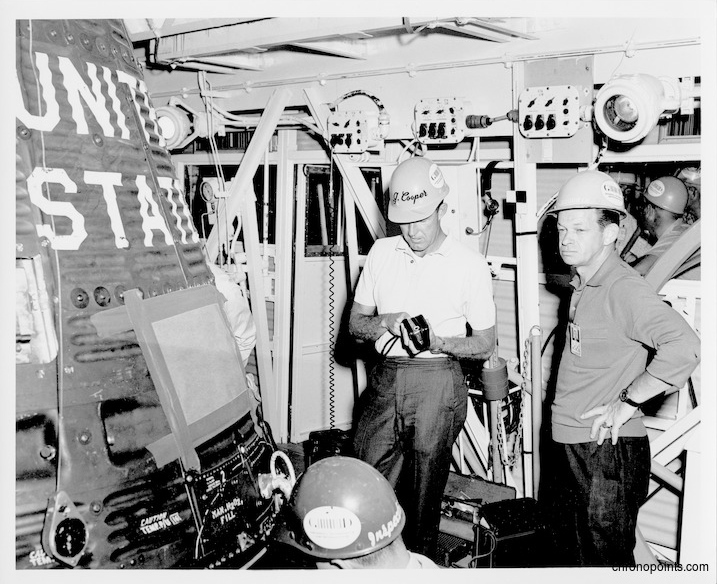 Gordon Cooper (1927-2004), the astronaut aboard the last flight of Project Mercury, observing capsule preparations at Cape Canaveral Air Force Station Launch Complex 14 (LC-14), as unidentified others look on. Cooper was to become the last American to go into space alone, while setting new endurance records for the American space program. Faith 7, the name his spacecraft was dubbed, launched successfully and circled the earth 22.5 times. While in space, Cooper was one of the early practitioners of conducting scientific observations in space. 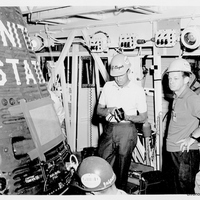 “Astronaut Gordon Cooper and Faith 7 Capsule at Cape Canaveral Air Force Station Launch Complex 14.” RICHES of Central Florida accessed April 23, 2019, https://richesmi.cah.ucf.edu/omeka/items/show/5019.